I’d like to tell you an old story that still wanders the Montana countryside. It starts in the summer of 1936 when a Montana sheepherder fell ill. He was transported to the St. Clare Hospital in Fort Benton, where eventually his sheepdog, Shep, found him. The man was dying, and the dog, with the intense loyalty of those shepherd breeds, would not leave his old friend. As the story goes, the nurses helped the dog stay, feeding him scraps of hospital food and keeping him out of trouble until the old herder finally died. The man’s family was back east, and they arranged to have his body shipped to them for burial. Even then, Shep stayed loyal, and followed the casket out to the train depot. He waited as the casket was loaded into a boxcar then watched the train pull away. For the next five-and-a-half years, Shep returned to the station, and waited for his friend to come back on the train that had taken him away. Four times a day, Shep would go to the station and watch the passengers disembark, looking for his companion. The station’s workers observed this behavior and figure out the story. They began looking after the dog, insuring he was fed and watered. Word of the loyal dog in Fort Benton spread and he became a celebrity of the depression era. According to Atlas Obs cura, who published Shep’s story, The dog was featured as an oddity in Ripley’s Believe It or Not! . Travelers would take detours to see him at the station. Children sent him Christmas presents. Some of them even tried to adopt him, but Shep was a one man dog. Shep died in 1942. The town of Benton honored him with a grand funeral, attended by nearly everyone in town. His grave is on a hillside overlooking the town. 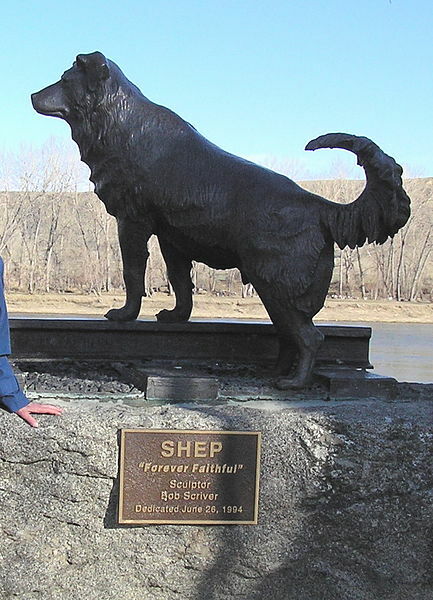 A wooden statue of a loyal herding dog was put there, and over 50 years later, Shep had not been forgotten. In 1994 he was immortalized with a bronze sculpture by the Montana artist Bob Scriver. Great dogs don’t come around very often, but when they do, they make us better people. Their loyalty and love is humbling. It makes us want to be worthy of such devotion.